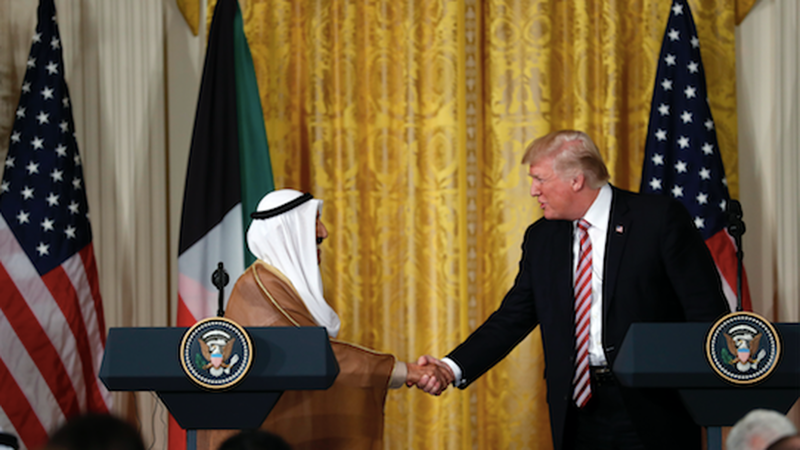 At his joint press conference with the Emir of Kuwait on Thursday, President Trump said he "would be willing to be the mediator" for the diplomatic crisis in the Gulf, even offering to host the feuding countries at the White House if necessary. He later added that if "certain countries" don't "stop the funding of terrorism, I don't want [the GCC] to come together." On North Korea: "Military action is definitely an option. Is it inevitable? Nothing's inevitable... I would prefer not going the route of the military, but it's something certainly that could happen." Palestine-Israel peace deal: "It's an event that's just never taken place... sometimes people think they're close and it just never happens... I think we have a chance of doing it... but again I say that a little bit reluctantly." Syria: "As far as Syria's concerned, we have very little to do with Syria, other than killing ISIS." Correction: the first sentence has been corrected to show President Trump did not mention Qatar by name, but said "certain countrines."